I usually don't buy stamps from Michaels unless they are a major brand, but I made an exception when I saw this set featuring this cute canning jar. I stamped it on a white base and then colored it in using Copic markers. I just love the little bugs in the jar! Then I stamped the lid on some patterned paper and cut it out . Same with the tag. Then I ovverstamped the lid with the tie stamp. I just had to add some hearts, so I die cut some and then added red Stickles. 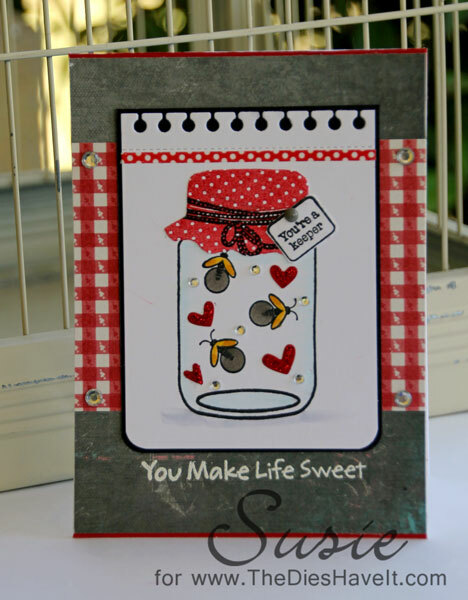 The red and white check is really from a Valentine paper line, but it worked well with my card, so I added it to my grey background. I hope this card brings a smile to your face!